Solar IS Civil Defense - what we are all supposed to have on hand in case of emergency - flashlight, cell phone, radio, extra set of batteries - can be powered by a few square inches of solar electric panel. Add a hand crank or bicycle generator and you have a reliable source of survival level electricity, day or night, by sunlight or muscle power. This is also entry level electrical power for the 1.5 billion people around the world who do not yet have access to electricity. Civil defense at home and economic development abroad can be combined in a "buy one, give one" program like the Bogolight (http://www.bogolight.com) which is a solar LED light and AA battery charger. 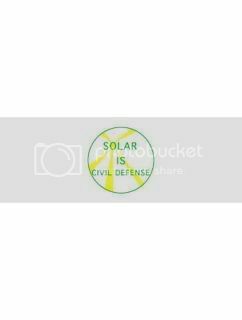 Solar IS Civil Defense and could be much more. I wish the mainline environmental groups had been broadcasting practical material like this for the last twenty years or so instead of devoting almost all their advertising to scaring us about climate change.